ReptiBreeze® LED Deluxe | Zoo Med Laboratories, Inc. Zoo Med’s ReptiBreeze® LED Deluxe is an open air, screen enclosure that allows for ample air circulation, making it an ideal habitat for reptiles such as Chameleons, Crested Geckos, and More. Made with an aluminum frame and screen that resists rust and corrosion, this habitat has two doors on the front that provide for easy cleaning and terrarium access. 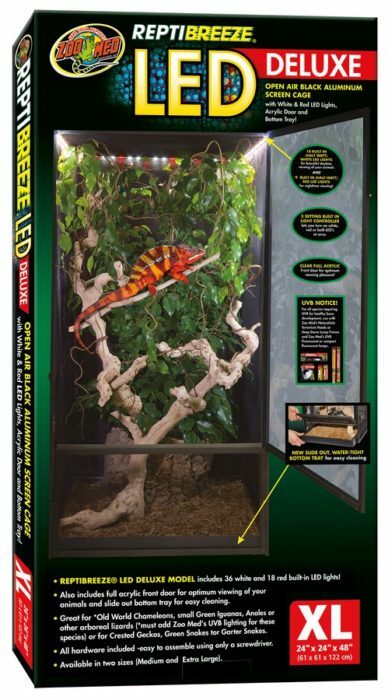 This Deluxe version also features a clear acrylic door panel that allows for unobstructed terrarium viewing, an easy-to-clean, removable bottom tray that can be used to hold substrate and excess moisture, and also features built-in, touch-activated LED lights for illuminating your pet’s habitat with three different settings. Made out of rust resistant aluminum. Two doors on the front allows for easy cleaning and access. Clear acrylic door panel allows for unobstructed terrarium viewing. Removable bottom tray for easy cleanup. 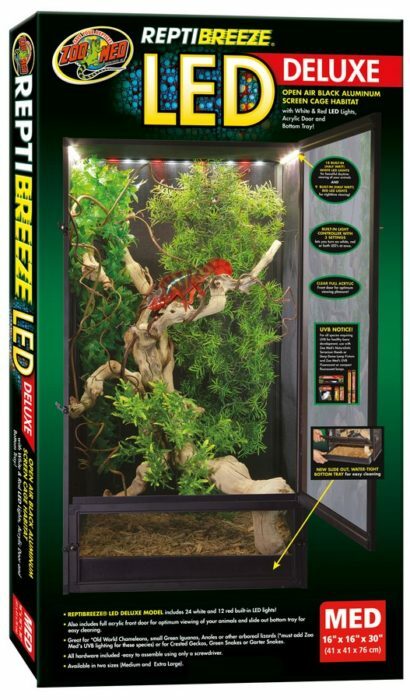 Let Ashley walk you through the features included in our ReptiBreeze® LED Deluxe.